Thousands of protesters have again rallied across France as the Yellow Vest demonstrations show no sign of abating. Despite authorities banning gatherings in many locations, the crowds took to the streets for the 20th consecutive week. There was a heavy police presence throughout the country. RT reports: In Paris, protesters gathered in two locations, forming a joint column. The Yellow Vests are now marching towards Trocadéro square. The march has been largely incident free so far, yet a thick plume of smoke was observed a couple of times near the demonstrators. It was not immediately clear, however, if it was tear gas or not. At least 25 people have been detained in Paris, according to the first official figures from the city’s police. Minor clashes between riot police and the Yellow Vests occurred in the city of Avignon, where protesters were allowed to demonstrate only in one location. Following the brief scuffles, the protest continued peacefully. 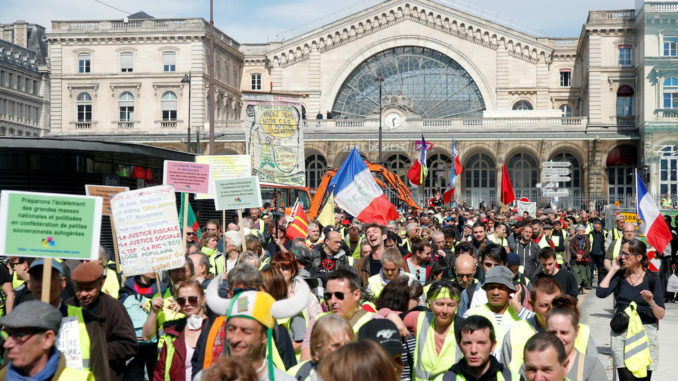 In Bordeaux, a group of vandals attacked a bank, smashing its windows with iron bars while thousands marched peacefully through the streets of the city. The protesters are also seeking to show solidarity with Genevieve Legay, a 73-year-old anti-globalization activist, injured in Nice last weekend. “We are all Genevieve!” an online appeal for the protests reads. Legay was one of those who braved a blanket ban on protests in Nice and got pushed down by a police officer, receiving a head injury, according to the city’s prosecutor. While the injury caused outrage by itself, French President Emmanuel Macron managed to add insult to it when earlier this week he squarely blamed Legay for the incident. 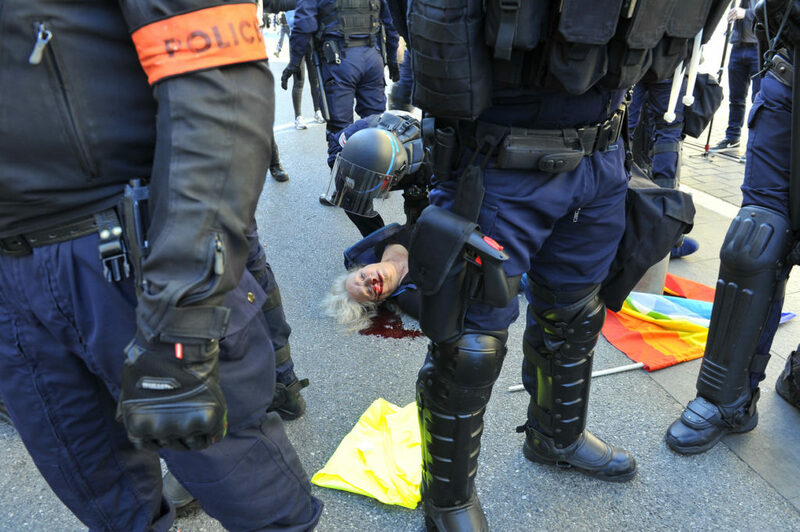 The remark drew anger from the activist’s family and fellow protesters, who accused Macron of being patronizing and disrespectful, as well as of whitewashing police violence.